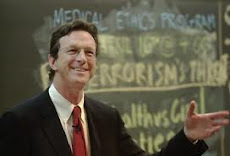 When Michael Crichton died, there was a brief tribute to him that aired at the beginning of ER on Nov. 13, 2008. It featured Eriq La Salle (who played Dr. Peter Benton) . When Michael Crichton left us, he left a grand legacy in both television and motion pictures, but it’s ironic that the show is gonna retire its number in the same year that Michael left us. The final episode is a bit of a homage to what we did in the first episode, in the pilot. And I felt as if he wrote it with me, you know. We had sat in a room and made the changes, and the things we needed to do in the pilot script. And I kept feeling like he was still there with me. I would have liked a longer recognition of Crichton’s contribution as the creator of ER, but that’s my own bias. With 15 seasons, the retrospective had a great deal of ground to cover. I discovered this two-part tribute on the homepage of Erik’s Michael Crichton Collection. Even though the narration is in Spanish, (which I don’t understand very well), the video clips are marvelous—with some footage I’ve never seen before. Ms. Nesbit said that Mr. Crichton left “many, many electronic files,” and that there could well be other novels or unfinished material. “We haven’t begun to really go through it all,” she said. Actually, I have been trying to get a sequel to Travels finished for quite some time. Michael Crichton fans will eventually have two new books to read. According to a New York Times article, Posthumous Crichton Novels on the Way, an adventure novel titled Pirate Latitudes which in set in Jamaica in the 17th century, will be published on Nov. 24. According to the article "The new novel, discovered by Mr. Crichton’s assistant in the writer’s computer files after his death, features a pirate named Hunter and the governor of Jamaica, and their plan to raid a Spanish treasure galleon." Harper Collins will also publish a technological thriller Crichton had started writing. Only a third of the novel was completed so the publisher, Crichton's agent Lynn Nesbit, and his estate plan to find an author to finish the novel based on Crichton's notes and plan to publish the novel in the fall of 2010. Ms. Nesbit said that Mr. Crichton was “the most private of all authors that I have ever met in my life,” and that he never showed his agent or his editor any material before he had a complete draft. She said that other than the general category of technological thriller, she had no idea what the incomplete novel was about. Ms. Nesbit said that she and Mr. Burnham had discussed some possible co-writers, but no decision had been made. She added that any selection would be made in collaboration with Sherri Crichton, Mr. Crichton’s widow, acting on behalf of his estate. I had assumed his new novel for Harper Collins was finished. (See Michael Crichton's New Book ) I do recall Michael Crichton saying in an interview that once he had completed his research and notes, the actual writing of a novel took only a few months.